BEDFORD-STUYVESANT — Every morning Julio gets up at 6 a.m. and goes to work for a company that no longer exists. He heads to his office, a 137,000-foot warehouse in Bedford-Stuyvesant, the same way he has for 25 years. When he gets there, he picks up any scattered trash outside and watches a security camera. Sometimes, if the weather's nice, Julio stands outside, greeting people who pass. The 50-year-old man is the caretaker for the Cascade Linen Supply Co. building at 835 Myrtle Ave., a role he took up in 2010 when the historic warehouse closed after 112 years of cleaning and supplying linens to the city's restaurants and hospitals. Julio, who asked that his last name not be included in this article for personal reasons, is one of hundreds of people who worked at the company who now look back fondly at its history, and ponder the future of the legendary building. "Everybody was like brothers," Julio said. "There were a lot of people crying. A lot of people worked for more than 25, 30 years." Julio started at the company in 1986, working for years as a catch-all maintenance man. He was at times a plumber, at times a carpenter and even a sometimes-mechanic. Despite the demanding work schedule, Julio said he never thought about leaving. "'Julio, go to the roof! Julio, go to the first floor! Julio, second floor!'" he remembered with a laugh. "I didn't care. I liked working hard." The former linen-supply and laundry factory was sold last month for $27 million to a group of investors led by Alliance Private Capital Group,the New York Post reported, and now, Cascade is poised for a large-scale residential and commercial redevelopment. That redevelopment is being followed closely by some former workers. 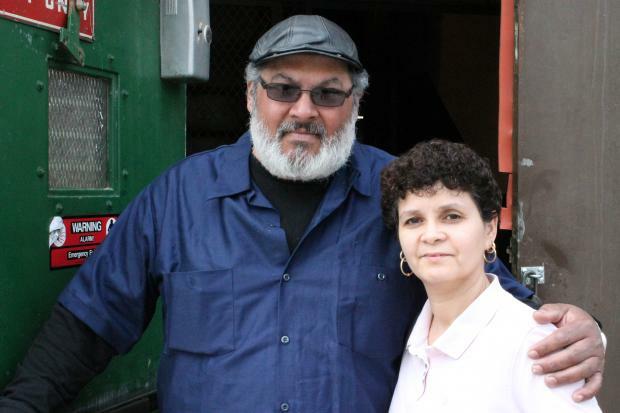 During a recent work day for Julio, a woman pulled up to the factory in an SUV and greeted the caretaker. The two had heard the news of the building's sale, and wondered out loud what would come of the property. "I hope they make it something useful," said Cynthia Velez, 48, who worked at Cascade for 22 years. Cascade was a large source of employment in the area, having employed hundreds of people, many from the neighborhood, said Velez, who lives in the nearby Tompkins Houses. That includes Velez and her brother, Victor Rivera, who raised a family by working at the company for 33 years, she said. The company was also known for hiring men and women of color, as well as recent immigrants, Velez said. "This was a place that was ethnically diverse," she said. The two former workers reminisced about Christmas parties and turkey raffles. They talked about special awards for employees: Manager of the Year, Worker of the Year, Salesman of the Year. Velez talked about the company's "benevolent fund," in which the truck drivers would take money out of their paychecks every week and, once a year, invite everyone to a picnic or fishing trip. The vice president of the company would help out by donating money to the fund, Velez said. But she also talked about some of what she said eventually brought the company to a close. The terrorist attacks on Sep. 11, 2001 hurt business, she said, as did worker injuries toward the end of the company's existence. But perhaps most damaging were allegations of conspiring with other linen companies to fix pricing. In 2003, a group of New York eateries sued Cascade and five other companies for allegedly promising not to compete with one another. Two years later, the companies' executives were indicted, and paid $6 million in cash and offered customers $3 million worth of vouchers to settle the case, according to Crain's New York Business. In 2009, the company was bought by Arrow Linen Supply, and the warehouse was shut down a year later. Now, the Cascade property falls within the new Bedford-Stuyvesant North rezoning area, and can support up to 342,600 square feet of residential development plus 101,000 square feet of commercial space, according to the website of Newmark Grubb Knight Frank, who brokered the deal. The property, across the street from the Marcy Houses, is also located off the Myrtle-Willoughby G train stop, which could make it an attractive option for artists and young professionals looking for a cheaper option than pricier Brooklyn neighborhoods like Williamsburg or Greenpoint. But the two former Cascade workers weren't worried about what the development would mean for the neighborhood. Velez pointed to the property behind the buildings on Stockton Street, also formerly owned by then-Cascade President William Troy, according to city records. That land was developed, and Velez, who said she remembers a time when you couldn't walk down Stockton Street at night, said the neighborhood is better because of it. But she and Julio couldn't help but reminisce about times long gone. "I still haven't even found work," Velez said, shaking her head. "This was my second job. It was great."